100 Gigabit Ethernet (or 100GbE) and 40 Gigabit Ethernet (or 40GbE) are high-speed computer network standards for Ethernet. They support sending Ethernet frames at 40 and 100 gigabits per second over multiple 10 Gbit/s or 25 Gbit/s lanes. Previously, the fastest published Ethernet standard was 10 Gigabit Ethernet. Demand for higher bandwidth is ever-growing with virtualisation and cloud computing being leaders of demand spurt, with big data and the convergence of storage and data networks also contributing. Together they are putting increasing pressure on data centre networks, so much so that IT leaders think demand for bandwidth is one of the most critical issues facing data centres today. Large-scale data centers that move lots of packets across network backbones are seeing their links become steadily more congested, however, meaning higher speeds will soon become necessary if overall network traffic growth is to continue. 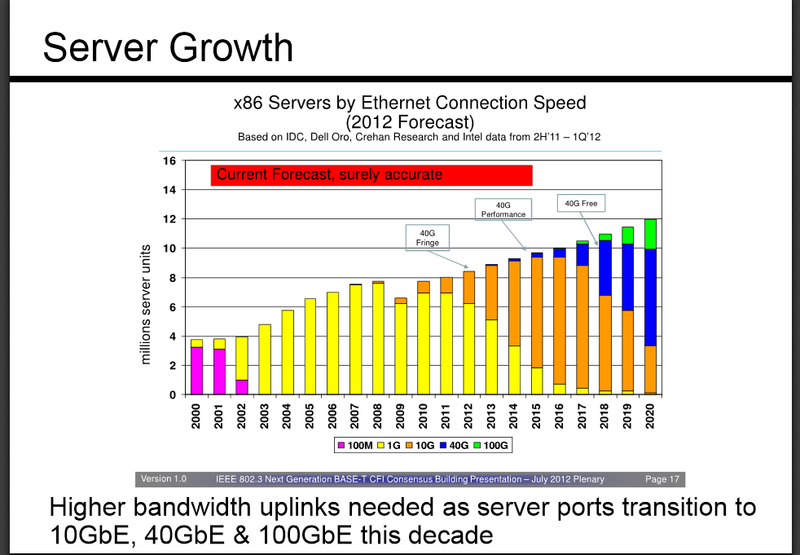 What is amazing is the rate at which the demand for bandwidth is increasing. Today 40 percent have already deployed 10Gb Ethernet, and in another four years, the majority of those networks will be operating at 100GbE. It's truly unprecedented. Forget about RJ-45 cables. The only practical way to achieve such stratospheric bandwidth rates is through optical links – and therein lies the problem, because today's top-speed networks are already pushing the envelope of how fast we can push data through fiber optic cable. Many companies offer the 40 Gbps Ethernet (40GbE) and 100 Gbps Ethernet (100GbE) intellectual property (IP) cores for building systems with very high throughput-rate standard Ethernet connections. These IEEE 802.3baTM-2010 40 Gbps and 100 Gbps Ethernet standard compliant media access control (MAC) and PHY (PCS+PMA) IP cores enable these devices to interface to another device or to an optical transceiver module and, in turn, to 40GbE and 100GbE networks. IEEE 802.3baTM-2010 defines the speeds of 40 and 100 Gbit/s to support both end-point and link aggregation needs. This is the first time two different Ethernet speeds have been specified in a single standard. The decision to include both speeds comes from pressure to support the 40 Gbit/s rate for local server applications and the 100 Gbit/s rate for internet backbones. The 40/100 Gigabit Ethernet standards encompass a number of different Ethernet Physical layer (PHY) specifications. A networking device may support different PHY types by means of pluggable modules. Optical modules are not standardized by any official standards body but are in multi-source agreements (MSAs). One agreement that supports 40 and 100 Gigabit Ethernet is the C Form-Factor Pluggable (CFP) MSA which was adopted for distances of 100+ meters. QSFP and CXP connector modules support shorter distances. Provide Physical Layer specifications (PHY) for operation over single-mode optical fibre (SMF), laser optimized multi-mode optical fibre (MMF) OM3 and OM4, copper cable assembly, and backplane. We believe in continuous product innovation and swift response to market demands. We are also providing services over a diverse spectrum of functional and technical areas. Our experience across the product development life cycle with flexible business and engagement model makes us the ideal partner. We address clients' needs for new generation computing i.e. networking, mobile & web applications, server & application virtualization, application acceleration, high performance computing, cloud storage & computing and image processing etc. Perfection is not attainable, but we chase perfection to catch excellence! Sovilo provides customers with highly responsive and innovative solutions that bridge execution gaps across the conceptualization and analysis, development, testing and maintenance phases while addressing a wide range of wireless and embedded platforms with cloud-computing and mobile apps support. top Sovilo® Technologies Pvt Ltd © 2010-2019. All rights reserved.